At the Sept. 24, 2018 West Des Moines Community Schools Board of Education workshop, Shive-Hattery presented options based on priority items indicated by the Board at a previous workshop. Determine what projects could be accomplished within the voted PPEL funding. Determine what projects could be accomplished if the one-cent sales tax (SAVE) is passed by legislation in 2019 to extend funding from 2029-2049. Descriptions of each phase along with corresponding options and costs. Pressure relief at Clive Learning Academy, Crestview School of Inquiry, and Western Hills Elementary. This is to address various space constraints which are impacting the educational environments. Improve classroom separation with doors at Crossroads Park Elementary and Westridge Elementary. Update locker rooms at Valley High School. Renovate section of Valley High School to create double door, office entry system at Valley High School. Renovations for secure entries at Indian Hills Junior High, Stilwell Junior High, and Valley Southwoods would be delayed because final decisions have not been made regarding these buildings. PK additions at Hillside and Crossroads Park Elementary Schools would be delayed until sixth-grade is moved to middle schools. Home School Assistance Program facility updates would be delayed until a decision is made on what will be done with Rex Mathes. Board Direction: The Board requested WDMCS administration bring the Phase 1 recommendation to the October 8, 2018 Board of Education meeting for approval. This would include project details along with cost and timelines estimates. Phase 2: Move sixth grade out of elementary buildings and into a middle school model (either two or three middle schools). Phase 3: Complete all other elementary buildings updates after sixth grade is moved to middle schools including creation of PreK program spaces at Hillside and Crossroad Park Elementary schools. 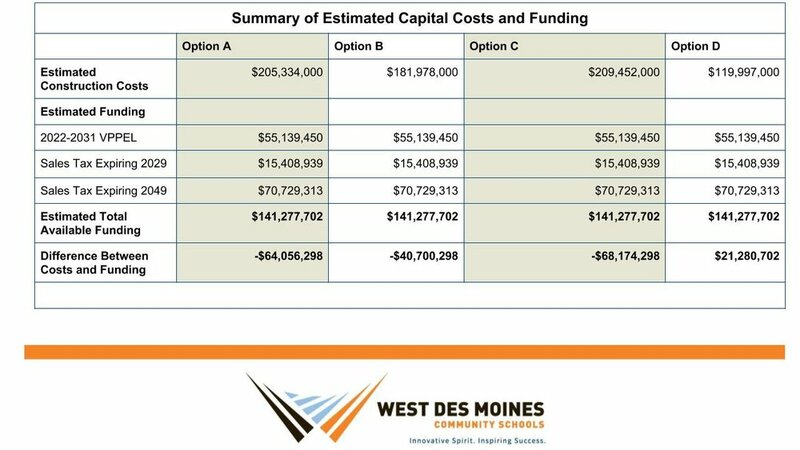 However, options A and B exceed the $141 million amount that could be available through all capital funding sources through 2049. See chart below for details. Board Direction: Review detailed plans from Option A and Option B to cut out the overages in the budget to meet the $141,000,000. This solution would eliminate the need to seek a bond referendum and remain as close to the goals established as possible. There is no specific deadline set for this task. An additional Board workshop will be scheduled this school year. Because the one-cent sales tax will not be voted on until spring 2019 at the earliest, planning can continue over the next several months without holding up Phase 1 initiatives.